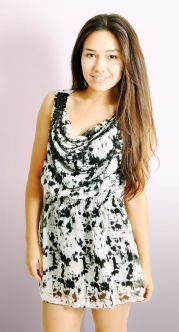 This is our favourite peplum dress! It is great quality and comes in two classic colours and features gold studs to the neckline and a deep V to the back. A very stylish, classy dress and the peplum features will definitely flatter your figure and hide any unwanted lumps and bumps. Wear with or without tights but heels are a must! Perfect for a night out with the girls or out for dinner with your bloke.